I couldn't get online much last week. So sorry for the lack of posts. 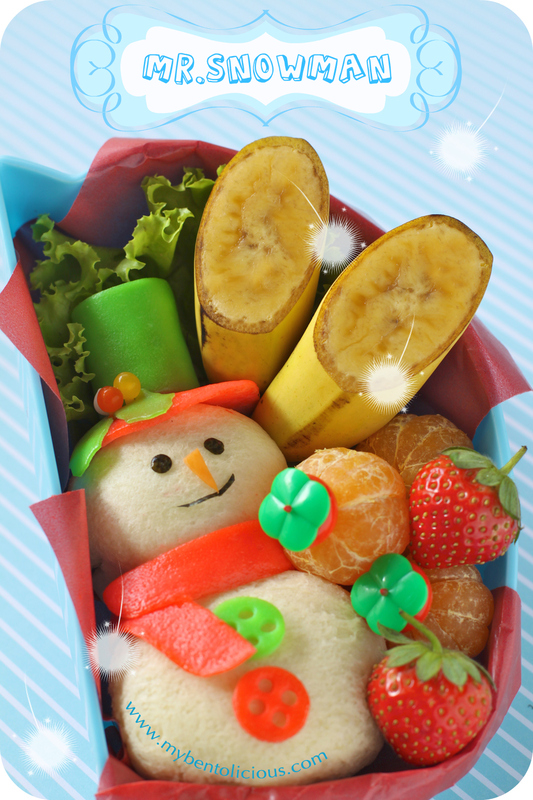 This week will be the last week of Christmas theme bento before the school holiday begins. My brother in-law's wedding was held on last Saturday. Everything went very well although it was raining in the morning during the Holy Matrimony at the church. Kids didn't attend the Holy Matrimony because Andrew got sore throat and a bit feverish, so they just attended the dinner party in the afternoon. For Monday's bento, I chose to make Mr. Snowman from bread as this will be a snack bento during the exam day. I stuffed pandan kaya jam inside the bread and added strawberries, tangerines, and bananas. The fruits were pretty tiny this time so fit perfectly in the small snack bento box. Mr. Snowman were decorated with fish sausage wrapped with egg sheet (hat), red egg sheet (scarf), colored egg sheets (buttons, hat), carrot (nose), nori (face details), and jelly balls (hat details). @yunitarahmasari aka tatabonita : That what Mr. Snowman get when he visits the tropical country hahaha ... Unfortunately no wedding theme because I don't have time to make one. Perhaps for my little brother's wedding on January, I will make one. Thanks a lot Tata for your kind comment! aku suka warna-warninya, buah2nya yg imut2 banget n snowmannya!!! @Sysyl : Kebetulan dapat baby strawberry ama jeruk kecil-kecil yg manis jadi pas buat snack box anak-anak :) Thanks a lot Sysyl! Have a wonderful trip! I'll miss your bentos :( This snowman is adorable! How do you get the bread to wrap around so nicely? It's perfect! Lia, Mr Snowman looks cute. Wish you and your family a wonderful holiday time. @Kyo : Thanks a lot Kyo! He looks so fluffy and soft, your cute snowman! Can't wait to hear about your tropical holiday! Looking forward to our break too! lovely snowman ^_^. It will be so cool to see the kids´ sandman :D! So, you are leaving next week right? Hope you will have a great time in your holidays!! OMG so adorable!! Love the colors and textures and the snowman him self is genius! Have a wonderful and fun holiday trip!! Fun and beautifully festive as ever, Lia! The ripe perfect strawberries add such a beautiful and cherry red accent. Can't wait to hear more about your Christmas holiday destination! @Mommyof2girlz : Thanks a lot Steph! aw, u make me want to make one too.